I’ve got to say something or I’ll explode. Each day, another so-called ‘business opportunity’ arrives on my doorstep. Sometimes three at a time! I don’t know whether to laugh or cry when I read them. Are these really, honestly, supposed to be ways the average person can make money from home? And I should know. I’ve made millions. So I know what works – and I know what doesn’t. Look, sorry to be blunt but most of these ‘opportunities’ are touted by BROKE people trying to scam a few quid out of other broke people. I’ve become so furious at the trash I’ve seen that I’ve decided to take action. What I want to do is to offer you a way through the maze – help you sort the diamonds from the glass and put you on the path to genuine prosperity. Spare me 5 minutes now, and I’ll show you how you could set up a tasty ‘cash cow’ internet business from home. I’ve shown thousands of people how to achieve this and I know I can help you. …it IS possible to make great money on the internet working just a few hours a week from home. But only IF someone reveals the genuine, profitable ideas that are out there RIGHT NOW making cash for ordinary people. And the good news is – at last there’s a way for you to get your hands on the ideas and the help you really deserve. For example: Just one idea I used made me thirty seven thousand pounds PROFIT in just 7 weeks. That’s not TURNOVER. That’s not SALES. That’s PROFIT (audited by Chartered Accountants). This is an idea I ran from home on my office desk. And it wasn’t even original! But there was one very special thing about it. IT WORKED!!! If I hadn’t found it I could have wasted years and thousands of pounds on junk ideas only to end up broke and depressed. But I know what works and what doesn’t. Maybe that’s the only real difference between us? Please be clear, I’m not trying to pitch you this idea. That’s how I made some of my money – it’s probably not how YOU are going to make your money. I’m just telling you this so you know it can be done. I’m living proof of that. Six months ago I came upon another really superb internet idea (I’m not trying to pitch this to you either, so relax!) I spotted it as a winner out of the huge pile of dross that lands on my mat each week. I decided to give it a go because I thought it had potential. I’ve sold £41,000 pounds worth in the last two months! The idea wasn’t even original. I didn’t have to do much work. In fact… before I came across this I knew diddly-squat about the subject. I just have a ‘secret method’ of picking the winners (if you’re interested, I’d like to show YOU how to get access to these winning ideas as well.). And by the way, £41,000 is just a start on this project. Are you thinking maybe that YOU couldn’t possibly make this amount of money? Not true! I forgot to mention, I have NO office, NO staff, NO warehouse – I gave all that up years ago (far too much hassle)! I ran this nice little earner from a laptop whilst on holiday sunning myself in foreign exotic locations. It takes me about an hour a day to run my seven totally different internet businesses. My point is that there are lots of really excellent internet ideas out there. In fact there are more than you could ever possibly handle. I’m talking about simple internet home-business ideas EACH of which could make you £3k, £5k, £10k A MONTH – without much of a breaking a sweat. Really, this is so easy to achieve - which is why I get so angry at the junk that lands on my mat. Making a million or two is harder, but £3k a month? A snap. And you don’t have to work very hard to achieve this – maybe a few hours a week? And when I say £3k a month, I mean from EACH idea. You can run one, two... or as many as you like. It’s up to you and how much you want to earn. BUT… the problem is sorting the wheat from the chaff. How do you tell the good ideas from the absolute dogs? How do you spot a genuine offer from someone of substance in amongst the pile of crap sent by broke people living at 3b Acacia Terrace – next to the railway line? You can’t. At least not without help. So what happens is you send off your hard-earned cash and hope against hope that this time, maybe you’ll get something worthwhile. A few days later it comes and… more disappointment. Either the idea is plainly unworkable, or it needs a lot of money, or it needs a huge time commitment. Either way, it’s a ‘no go’. I became so SICK of these ‘golden opportunities’ landing on my mat that I even tracked down one of these so-called ‘experts’ to see if he was the real deal or not. He was selling a course on how to make a fortune in the used car business. When I visited him at his terraced house (! ), I noticed that two of the panels on his own ‘motor’ were different colours! Nice one. And HE was trying to tell ME how to get rich! Have you fallen for something like that? There are a lot of ‘wannabees’ in the business opportunity game, most of them broke, most of them flogging ideas which they KNOW won’t make any money. Otherwise – they’d be doing it themselves, right? I mean, it’s not rocket science. But they won’t take too kindly to my exposing their game, and they won’t like me telling you what really works – because that means you won’t buy their ‘opportunities’! And I really DO know what works and can show you - I have not the slightest, tiniest doubt about that. So before I tell you precisely how I can help you, let me first check that you’re the right kind of person – I want to see if you qualify for this. If you’re heartily sick and tired of always being broke – head just above (or below!) the waterline, maybe it’s time to take a fresh look at things? You’ve maybe had a go at a few ideas (on your own, with no support); perhaps you’ve had some minor successes and a few failures. Most likely the net result is close to zero. Forgive me for being honest, but I’m wondering if after years of struggle, years of work and years of dreaming of a better life – you’re really not that much closer to making it happen? I’d also like to think you’re not a greedy person. Sure, if someone handed you a cheque for ten million you’d grab it (so would I!) but in the real world, you’d be very happy with an extra £3k - £10k a month, per idea, coming in. You’re also realistic enough to know that you get nothing for zero effort in this life so you’re willing to put in some hours as long as it is not too hard work. Let’s say you’d gladly do 5-10 hours a week for an extra £5k a month? Something like that? If this describes you (approximately, of course) then great. You qualify. We are totally on the same ‘sheet of music’ and I have something for you which you’re going to love. What’s the ONE thing you really, really need if you’re ever going to have a chance of making money on the Internet? Well, a few answers may spring to your mind. “A product.” “Start-up capital.” “A lucky break.” There are plenty of possible answers. But you know what I think you need? Knowledge from someone wealthier and more experienced than you. Putting it bluntly, you need a tip-off about what REALLY works to make money— from someone who has made a pile. You’re on a golf course and one of the people you’re playing with is a multi- millionaire. Let’s say he’s made ten million in Australia and he’s looking for someone to clone his system and make it work in the UK. He’s looking hard in your direction because he likes the cut of your jib. There’s a cool million in it for you if you set up the UK side of things for him. Okay, you may not be interested in his deal, but my point is you almost couldn’t fail could you? He’s got a proven system with proven profits. He has all the knowledge and experience to make millions and… he’s going to be guiding you every step of the way. I mean, you’d have to be a complete doofus to foul this one up, right? I reckon it’s very hard to make money on the net from scratch, with no help, no experience, and no workable plan, just as I reckon it’s EASY if you have someone willing to point you in the right direction. So you see, it’s hardly your fault if you haven’t really ‘made it’ yet. How could you when the deck is stacked against you? How on earth could you know what works and what doesn’t? Even if you lucked onto a plan that worked, how are you going to make a pile of cash from it without a guiding shove from someone who really knows how to make money? I don’t think you can. 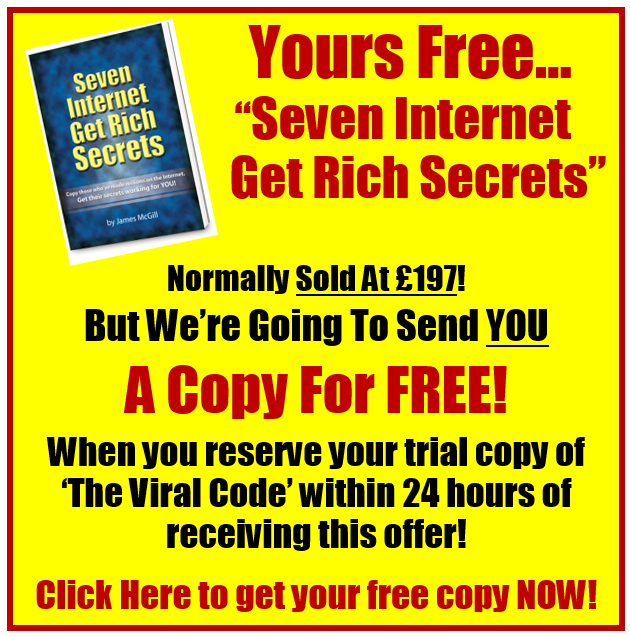 I have pulled together seven of the hottest ideas which are working right now on the Internet and put them all into one amazing manual called Seven Internet Get Rich Secrets. Please understand, these are ideas I am using myself to make money. They need very little money, very little experience and not much time to operate. And all you have to do is blatantly copy as many of them as you’d like to make money from. Start with one... and when you are pulling in (say) £3k a month extra, start up another one and build to £6k a month. Then another one... £9k a month. Heck run all seven if you want and go for a tasty £21k extra a month. How nice would that be? Why would you copy me? Because of my twenty years experience and multi-million pound fortune for starters! Like an experienced diamond dealer, I can tell a real gem almost at a glance – just as I can tell paste and zircon. Fantastic, because if you are, then you are one step closer to financial freedom. And THAT means never working again and enjoying 3x, 5x, 10x what you could earn in a normal job. Plus having tons of free time to relax and enjoy your money. What I’d like to do is to rush you a copy of my manual so that you can get started this very weekend. You would never have come across these ideas by yourself. You won’t make millions out of them but that extra £3k - £10k per month, per idea could sure come in handy! 2-3 hours a week should be enough for each idea. I’m so certain these ideas can help you that I’ve insisted that my publishers offer a 100%, no quibble money-back guarantee for you. Please understand these ideas are not your ‘ticket to riches’ (let’s face it £3k extra a month is hardly a king’s ransom). To be honest I’ve yet to see a workable idea which can make you a millionaire in little time, with little money. It’s about a way of quickly generating a few extra thousand a month—and that makes a BIG, BIG difference to most people’s lives. It’s the difference between merely surviving and living a comfortable life. And of course you don’t have to give up work until you are generating enough from these ideas to put two fingers up at the boss. The other thing I want to say is that these are not silly ‘get rich quick’ ideas where you do nothing, tap a few keys, and cash pours into your account. These are serious ideas for people seriously sick of just getting by. They don’t require a lot of work, but they do require some work. So if you’re after something for nothing, then respectfully, I suggest this is not for you. What I DO know is that if you apply yourself and sincerely set out to blatantly copy what I will teach you in Seven Internet Get Rich Secrets you really WILL make decent money from home. I sound pretty sure don’t I? Well I AM sure. In fact I’m 100% certain you could pick up any one of these ideas and start pulling in so much money you’ll laugh with joy when you see your bank statement in three month’s time. I’m so certain because I’ve done this type of thing time and time again and frankly it’s ‘small beer’ for me these days – so you may as well clean up from them too! Just imagine what your life would be like with £36,000 EXTRA a year...? Once you begin making this kind of money, everything changes. And I mean EVERYTHING. Suddenly you believe you can see a way out of your money problems. Suddenly you know that making a whole load of extra money from home is the easiest, most fulfilling thing in the world. Thousands of people are doing just this. Take a look around you as you drive down the road. It’s chock-full of the latest 4x4s, BMWs and Mercs, isn’t it? Sure, some of these people are company execs and the like, but you’d be surprised how many of them have a ‘nice little earner’ going on the side. The point is – YOU CAN JOIN THEM! Okay enough from me. I’m hoping you’re excited enough to get going. So now I guess it’s over to you. Do you sincerely want to TAKE ACTION to break free of your current situation? Let’s face it, talking and reading won’t get you where you want to be. You have to risk a little, take a chance and learn something new. What do you have to lose? NOTHING, apart a little time, maybe. I said at the outset that it’s my belief you almost CANNOT FAIL with a plan from someone who has made serious money. It’s up to you now. It depends on how much you really want this... how much you want to step off the treadmill and start earning the money you deserve – for one quarter of the effort. I hope you’ll make the right choice. 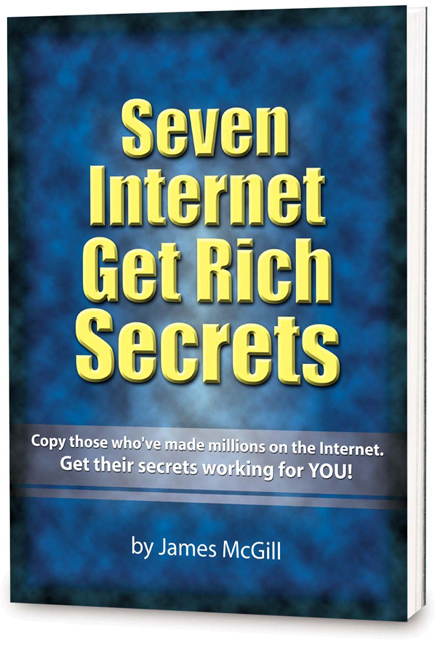 I look forward to rushing you your copy of Seven Internet Get Rich Secrets. PS It really is possible for to make an extra £3k a month from the Internet but only IF you are tipped-off about what works.